Meet Ziggy, our newest, young adult giraffe. At almost 3-years-old (her birthday is in August! 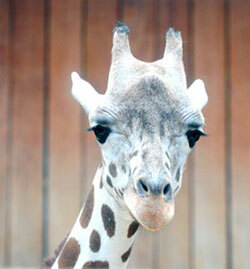 ), Ziggy stands about 13 feet tall, but by the time she reaches full adulthood she’ll be between 15 and 16 feet tall. Ziggy was acquired from Disney’s Animal Kingdom with the hopes of future breeding. Ziggy is starting to relax and settle in to her new home, but she still stays very close to her newest giraffe friend, 21-year-old, female, Rahna. This type of behavior is common for a young giraffe. Our giraffes are fed alfalfa hay and fiber pellets. When was the last time you fed a giraffe? The Milwaukee County Zoo allows visitors to feed giraffes daily, at the MillerCoors Giraffe Experience, at 10:30 a.m. and 3 p.m. Giraffe feeding tickets can be purchased at the Zoo’s Flamingo Gift Shop, the same day as your visit. Stop by the exhibit to feed the giraffes and welcome Ziggy! Giraffes are the tallest mammals in the world, native to the African savannas of eastern Africa. There are eight different sub-species of giraffes. The Milwaukee County Zoo’s giraffes are from the sub-species called reticulated giraffes known for large brown spots separated by cream-colored lines.